TBSHS have beaten Redbourne 4-0 and have progressed into the last 8 for the first time in the School's history for a senior team! 1st X1 beat Redbourne School 4-0 in round 6 of England Schools National competition, and advance to the quarter finals for the first time in TBSHS history! We have been drawn at home to the winners of Hampton School and Southend School for boys, on Wednesday 6th Feb in the County Cup semi-final away at St Clement Danes. 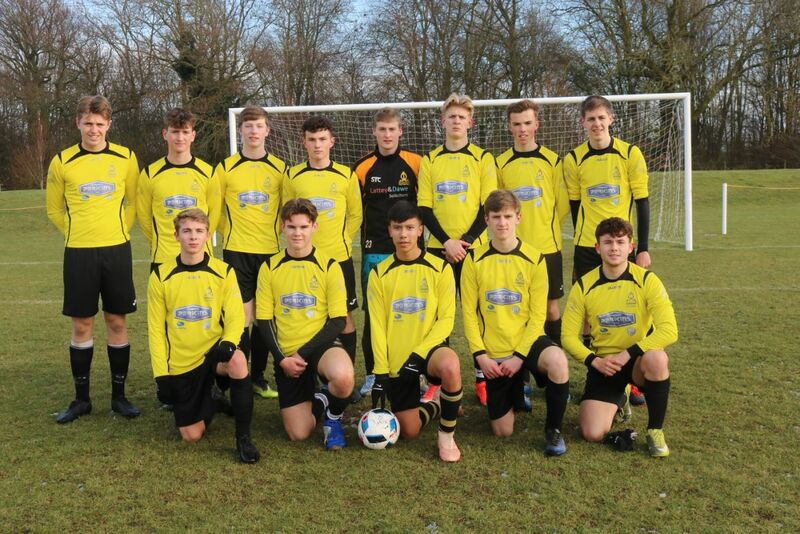 The TBSHS 1st X1 created school history yesterday by becoming the first senior football team to reach the English Schools quarter finals, after a comfortable 4-0 victory yesterday against Redbourne Community College. There was some serious doubt about the game being played due to frozen ground, but the referee decided Jobbers Wood was fit for purpose and so the game kicked off in freezing conditions with a firm and bobbly pitch. After a frenetic first 15 minutes with both side getting used to the challenging conditions, TBSHS took the lead with a shot by Callum Taylor from outside the box which nestled in the bottom right hand corner. This settled the home side down somewhat and they started to play some decent attacking football, with Elliot Long and Lewis Powell constant threats down the flanks. It wasn’t long before TBSHS doubled the lead after Jack Walker crossed from the left, for Elliot Long to finish neatly. This appeared to fire up the opposition, whose tactics of playing the long ball towards their big target man began to cause some problems for the centre back pairing of Adam Crowther and Connor La Plain. Redbourne pressure nearly brought them a goal as corner after corner severely tested the TBSHS defence. However, the home side stood firm and a deserved 2-0 half time score line was the result. The second half was very much one way traffic, with TBSHS camped in the opposition half. Chances came and went for the hard working Francis Moore and Harry Andrews, but the game was put to bed mid-way through the second half when Jack Walker was put through and spotted the keeper off his line. Walker produced a cute finish lobbing the stranded Redbourne stopper. TBSHS, already without Will Skingley in goal were grateful for Marc Hardie’s vital touch at a defensive corner to keep the score line at 3-0 in what was the only attacking moment of the half for Redbourne. Injuries to both Harry Bennett and Jamie Reynolds gave opportunities to George Harris and the industrious Josh Schlanker who both showed they are more than capable of adding quality to this team. The game had more of a reflective look about it when TBSHS made it 4-0 with yet another lob from Jack Walker following a cross from Lewis Powell. That remained the final score, and now the team face a tough quarter final against the winners of Hampton School and Southend School for Boys. The Team play their next match on Wednesday 6th February in the County Cup semi-final away at St Clement Danes.